SFC Smith distinguished himself by extraordinary heroism while deployed in support of Operation Iraqi Freedom, which resulted in him being awarded the Silver Star Medal. On August 2, 2006, SFC Smith's platoon came under heavy automatic small arms fire wounding one of the soldiers on his team. 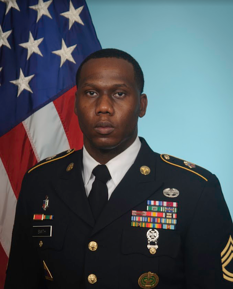 Disregarding his own personal safety, SFC Smith, the unit's combat medic moved under enemy fire to the wounded Soldier, carried him to a covered position and began administering aide, saving the life of his fellow solider. His heroic actions during combat operations in Iraq contributed to the success of the command's mission. ASYMCA is pleased to honor Angel of the Battlefield award recipient Sergeant First Class Darius Smith.